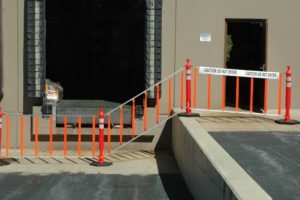 Omega Industrial Products is eager to introduce a new, first-of-its-kind pedestrian safety barrier in the US. The R.U.F. Roll-Up-Fence is an innovative solution to protect dangerous work platforms and pedestrian traffic zones. The only true Delineator Post barrier system available today, this patented product saves time and money for contractors, public work projects, and event coordinators anywhere pedestrians need to be directed or segregated from hazardous work zones. While caution tape falls and damages easily, the R.U.F. is the only full-height, rigid top and bottom rail designed to fit almost all delineator posts available. Do you need crowd control barriers for moving to different areas at some point in the event or do you need them to stay in one place? Portable crowd control barriers are easy to install as compared to the heavier one. While selecting crowd control barriers in many cases, lighter weight and easy to install barriers are highly recommended. In this instance, you need portable crowd control barriers for safety reasons. For different work platforms, these portable crowd control barriers are strong and durable that can work outstanding in temporary conditions. To protect pedestrians and providing guidance to the drivers all overcrowded areas, the portable crowd control barriers are easy to set up. To separate the crowd from the stage or managing light crowd or the bigger crowd of traffic, you can simply use the portable crowd control barriers. Instead of using the tape barriers, you will be convenient with these portable crowd control barriers in all work platforms. Almost in all work platforms, you can install the durable and portable crowd control barriers with boundaries highly visible. While each portable crowd control barrier looks similar, but in some ways, they are really different. You must be sure while scrolling the model of portable crowd control barriers that suits best to your needs. 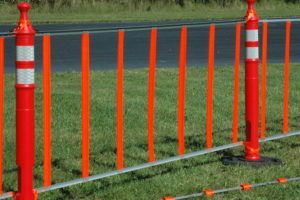 Portable crowd control barriers generally come in various molds, colors, and sizes. Here you can find the best portable crowd control barriers practically fit for all work platforms. You must go for the higher visibility colors of portable crowd control barriers for the events of the evenings and nights. Although, the portable crowd control barriers designed with a unique interlocking system that uses on various different surfaces and angles. All these features of portable crowd control barriers make them perfect for ground and sloping terrain as well as over street curtails. No matter you want to use them indoor or outdoor, as they are highly adjustable to all work platforms. Contact us today to find out more about how Omega’s products can keep workers safe and secure.